It has probably been a month now since a pack of BIC Retractable Dry Erase Markers hit our office. I tend to not question why boxes of random products show up as often as they do, because you should never look a gift horse in the mouth (unless the horse is full of Greeks). Last week a bunch of cans of Organic Sweet Leaf brand Tea showed up, so we did our duty to God and Country and drank most of it. Many moons prior we had some dry erase boards installed in our offices to help curb our addiction to covering walls with post-it notes. Approximately 3 fortnights after the dry erase boards were installed, I was given a Neon Orange Dry Erase Marker. After some lengthy internal monologue, I put that marker where it belonged, in the trash. So when another Dry Erase product hit my desk, I was skeptical. Low Odor? High Performance? 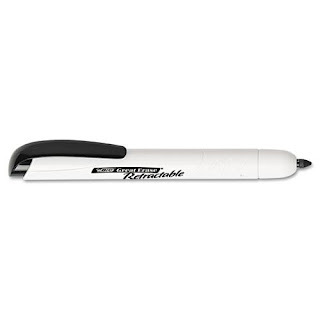 A fine tipped Dry Erase Marker? I doubted that this product could live up to the hype surrounding it. I cast the Dry Erase Marker aside knowing that the previous "advancement" in Dry Erase Marker technology was none of the sort and went along with my day to day business. At one point however I was writing some excruciating boring technical jargon on my Dry Erase Board and realized that it was way bolder than it needed to be. My conventional Sanford Dry Erase Markers only knew how to scream text and I needed something more conversational so I begrudgingly picked up my BIC, clicked it (was satisfied by the retractable technology used to keep the marker from drying out), and began to write. After the day was through I was a convert. 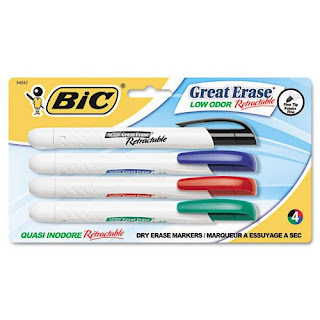 If I need to write on a Dry Erase Board, I need my BIC Retractable Dry Erase Marker. It turns out the marker is definitely Low Odor. I don't know if that's just a byproduct of a narrow tip not slathering my board with the ink that needs to quickly dry and spew forth the aroma of a New Jersey Chemical Plant, but I approve none the less. Nobody's getting high off this marker any time soon. High Performance? I don't know how you judge a marker on it's performance, but it has worked whenever I needed it to. It draws pictures and writes text on demand. The retractable feature works well and means you'll never have to worry about losing or damaging your caps (around our office we have broken 2 different standard marker caps leaving the markers unusable). Should you buy some of these Dry Erase Markers for your office? Yes. Yes, you should.